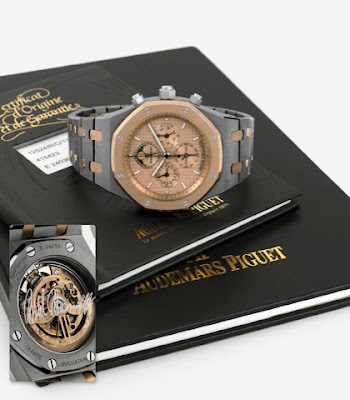 Antiquorum’s next "Important Modern & Vintage Timepieces" auction on June 8, 2011 in New York includes an item which was most likely included in the sale before the rather public revelations of watch collector/ex-actor/ ex-Governor Arnold Schwarzenegger’s infidelity, ten year old child, and the resulting marital breakup. No doubt the current situation will lead to greater interest in watch, though whether that will translate to a higher realised price is another question altogether. “AUDEMARS PIGUET - TITANIUM & PINK GOLD GRAND COMPLICATION MADE TO CELEBRATE THE 125TH ANNIVERSARY OF AUDEMARS PIGUET SPECIFICALLY FOR THE INAUGURAL 'TIME TO GIVE' CHARITY AUCTION AND BEARING THE SIGNATURE OF ARNOLD SCHWARZENEGGER - PIECE UNIQUE Audemars Piguet, Genève, “Grande Complication," case No. E 24036. The rest of the catalogue can be viewed here. 9 June 2011 : The watch fetched a hammer price of USD310, 000. That's 374,500 USD with the buyer's premium. what a beautiful watch... love it but alas a very pricey watch!